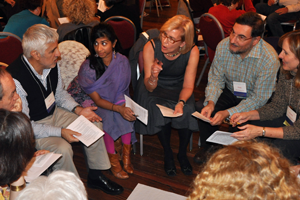 The Manhattan Professional Discussion Group offers a wide range of stimulating and educational experiences for all who are interested in furthering their understanding of group process. We invite some of the most interesting figures in the New York group world and beyond to present on exciting issues relevant to group practice. We enjoy exploring group from multiple perspectives. In addition to clinicians, clergy, educators, artists and business leaders have found the workshops helpful. Previous topics have included working with sexuality in group, group processes in music, diversity in group work, coping with aggression in groups, groups in schools and corporations, group work with trauma. etc. We value diversity and openness and welcome all in the community interested in exploring the role of group relations in our personal and professional lives. (Nathan Perlman Place is a short block parallel to and halfway between 1st & 2nd Avenues and between 15th & 16th Streets.) It is two blocks from the 1st Avenue “L” train station.